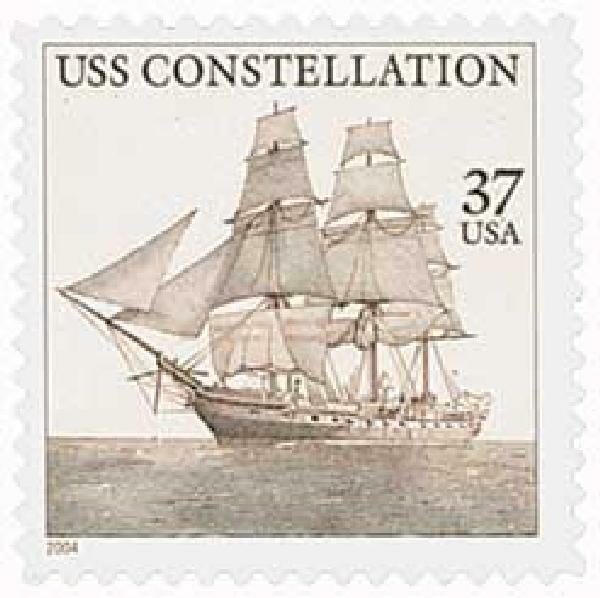 U.S. #3869 honors the second Constellation, built in 1854 with some materials salvaged from the original ship. Ordered by a Congressional Act in 1794, the first American ship to be christened the Constellation was launched on September 7, 1797. Designed by naval constructors Joshua Humphreys and Josiah Fox, the Constellation was the first ship commissioned into the United States Navy and the first put to sea. As such, it received the most esteemed name – Constellation, in honor of the ring of white stars against a blue background that was once featured on the American flag. The Constellation later traveled to the Mediterranean, participating in the blockade of Tripoli, evacuating Marines and diplomats, and joining in the battle that led to peace in 1805. During the War of 1812, the Constellation was blockaded by the British fleet, but it helped protect the forfications at Craney Island. After that war, the Constellation returned to the Mediterranean to once again battle the Barbary powers and helped capture the Algerian frigate Mashuda. Aside from brief periods of repairs, the next several decades were busy for the Constellation. It protected American shipping operations in South America and the Mediterranean and helped end pirate and slave operations in the West Indies. The Constellation landed shore parties and provided boats for the Seminole uprising. In the early 1840s, it safeguarded American interests during the Opium War and protected Hawaii from becoming a British protectorate. The Constellation was essentially retired in 1845, remaining in the naval yard until it was dismantled in 1853. But many of its salvageable materials were used to construct a ship of the same name. That ship, U.S. sloop of war Constellation, was launched in 1854 and sent to disrupt the slave trade off the coast of Africa. At the outbreak of the Civil War, it made the first Union Navy capture. Later, more than 60,000 World War I recruits trained aboard the Constellation. 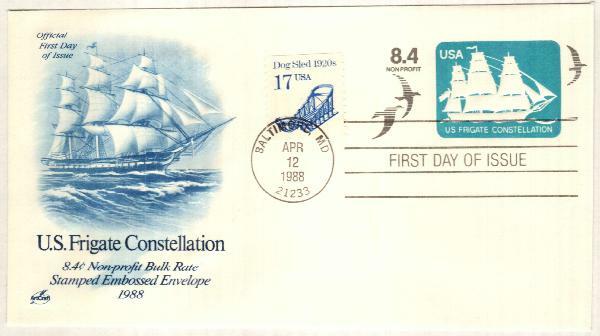 15 Responses to "This Day in History… September 7, 1797"
It’s so great that you would use the UsS Constillation as your stamp for today, as I am a volunteer on the NJ Tall Ship, aka A.J. Meerwald, last of 500 oyster schooner that were specifically made with shallow draft and wide deck, for collecting oysters off the New Jersey shores. http://www.bayshorecenter.org is in port Norris NJ aka (BiValve) the name that honors the 2 shelled Oyster which made more millionaires in the 1930’s than any other place in the world per capita, sending 90 rail road cars a day full of oysters to every part of the country. Thanks for another job well done….Carole Lokan Moore,, Founder Camp Whitebriar,’s Ben FrankLinStamp club and now on http://www.radiovisionnetwork.com “kids/hobbies” television show. tune in. Please kep up the good work. It is very enjoyable and I, myself, am learning somethings that was not taught in school a long time ago, like 55 years ago. Thanks for the history lesson. Found the part about protecting Hawaii from British control interesting. Absolutely fascinating. What a history of this ship! Beautiful ship. Good story. Thanks, Mystic. You missed a golden opportunity to commemorate Labor Day. Why? These history facts are wonderful. It is now a part of my routine to enjoy a daily history lesson over my morning coffee. I am also making a list of related stamps to collect and enjoy over our cold winter months when cabin fever sets in. That’s a great idea! Thank you. Always full of interesting facts!~ Thanks!! Let’s change it to fortifications.